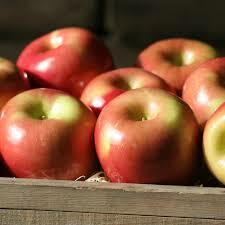 Fuji is surely one of the more attractive modern apple varieties. Its main characteristic is the lovely pink speckled flush over a yellow-green background. It is also crisp and juicy, with dull white flesh which snaps cleanly. The flavor is predominantly sweet, very refreshing.